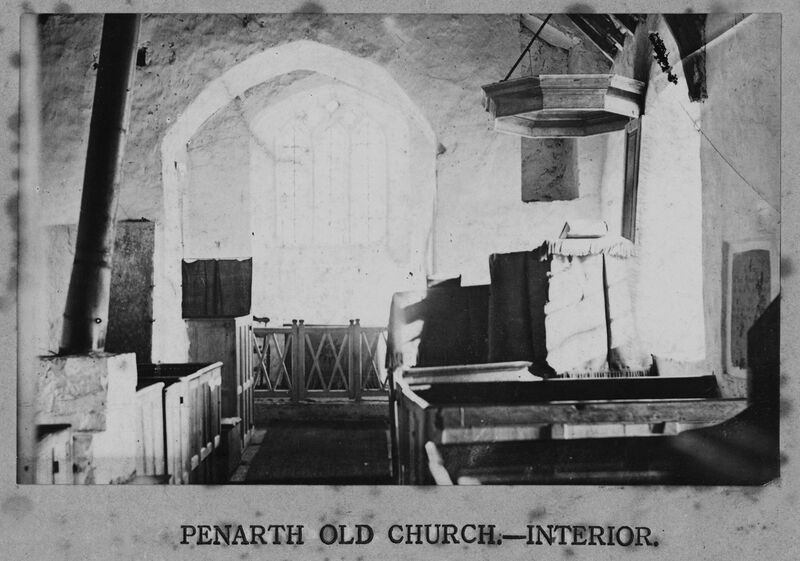 The church was built in 1865-66 replacing the mediaeval church which, although it had been big enough for the small rural community it served, had become too small for the rapidly growing town. Lady Windsor paid for the rebuilding of the church. Butterfield is usually associated with multi-coloured exteriors but St Augustine’s was built in the same grey stone as the rest of the town although there is some pink sandstone on the north porch and the tower. The saddle-back shape of the tower of the old church was retained as it is a land mark for shipping. Since 1935 the tower has housed a peal of eight bells. These were re-cast from the original six bells which were hung shortly after the new church was built. The tenor bell of the present peal weighs 660kg. St Augustine’s was built in the Early English Gothic style of the 12th and 13th centuries. The main features of this style of architecture are simple Gothic arches and tall narrow windows with a pointed arch at the top (lancet windows). 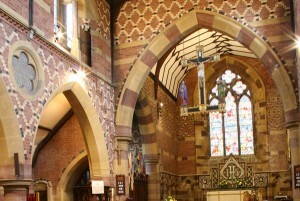 In contrast to the grey exterior the inside of the church is very colourful with patterns in red, black and cream brickwork. The pillars are of pink and plum Radyr stone with Bath stone arches. The altar has a marble reredos containing the letters IHS, the first letters of the name Jesus in Greek. Above the reredos is the East Window depicting the Ascension. The window is by Alexander Gibbs. 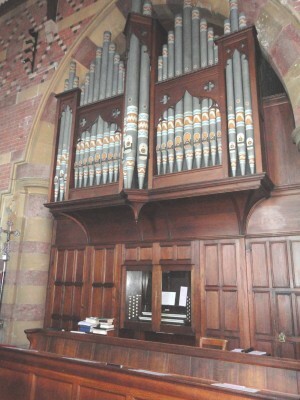 In the chancel is an organ by William Hill. It is said to be one of the finest parish church organs in the country. Between the arches of the nave are panels containing the Beatitudes from the Sermon on the Mount. 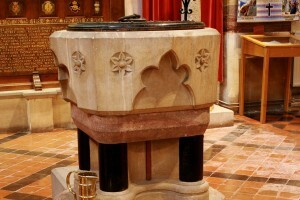 At the back of the church is the Font, designed by Butterfield. An octagonal bowl of Bath stone it is supported by four black marble shafts on a base of pink Radyr stone and Bath stone. 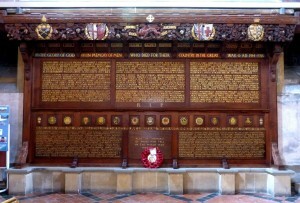 The Roll of Honour on the west wall is a memorial to men of the town who died in the First World War. After 1945 the names of those who died in the Second World War were added. Above the Roll of Honour is the West Window or warrior window. It shows Christ in majesty and four Old Testament warriors: Gideon, David, Jonathan and Joshua.